Oh my gosh. What an absolutely fun race!!! and the perfect one to be my first "race" back after a 2.5 year racing hiatus due to health/life issues. I am so thrilled to say that I am as of today on week 7/11 of training for my "comeback" half marathon in October so when my friend Brianna asked me to run the Dale F. Kilwein Half Marathon relay with her in Dickinson on August 27 I knew it would be the perfect "test" to see how I am doing pretty much halfway through training. Not only did I choose to do this race with her for that fact, but also because she reached out and asked! My daughter Amanda Rafferty and I met Brianna a few years ago at a YLEO get together in Medora. We sat at a table with some amazing ladies. Brianna was just this quiet, meek and mild young lady and her smile just radiated. We both felt drawn to her and I just had to hug her each time I saw her. I knew there must be more to her story and all I can say is she is a very strong amazing wonderful person and mom. I am so proud of her. Brianna and I have kept in touch off and on through Facebook and Instagram since then and I have loved watching her life's journey. When she asked me to run this relay with her, I cannot tell you the emotions I felt. I knew I wouldn't be ready for a race per say, but I knew I wanted to be her partner!! Amanda and a dear friend of ours was running the half marathon relay as well, so Amanda and I headed out Saturday and met Brianna at packet pickup. It was so great to finally get to hug Brianna again after not seeing her since we met in Medora and we also got to meet her son, Cody. The three of us headed out to check out the course as much as we could and it was so great to be able to spend some extra time with Brianna catching up. We went our separate ways with the plan to meet at the bus in the morning and Amanda and I proceeded to do some shopping and meet up with our dear friend and FINALLY spend some great quality time with her. Start time was EARLY!! The race was to start at 6am, so we had to be to the bus no later than 5:40. The bus took us to the start line of the race. The race route included a grass path, gravel and pavement and was around Patterson Lake and was to include a GREAT sunrise which you all know I love dearly. I was so excited to see Patterson Lake as I had never been there before even though its only 1.5 hours away from where we live. However, we woke up to a very dense thick fog!!! The bus dropped us off at the starting point and once we took off, it then took the second legs of the relay to the exchange point. Amanda was running the first leg as well so we got to start our 6 mile legs together. This was the start of the race. I asked Amanda to start in the back with me. I am in the blue headband and she is the pink :) Photo credit to Crystal Jahner. My plan was to attempt to run 5 minute run/1 minute walk intervals as a practice to see how I could do, but the start was pretty grouped together and I found myself really watching my feet so chose to run the first mile and then go to the intervals. That was the last I saw of my dear daughter. She took off and had a great race for her leg and she and our friend got third out of 9 teams!! After the first mile I was already feeling tired so once we hit the gravel I changed to 4/1 intervals and those felt great. It was so foggy you could hardly see anyone in front of you. We weren't on the gravel for very long and then we turned off onto the path that would take us along Patterson Lake. I absolutely loved this. It was different running on the grass path with ruts here and there but it was so much fun and so different. The fog and dew were so heavy that my shoes and socks were quickly soaked!! It doesn't look like much here but it went up and then turned to the right and inclined more. I panicked and even sent Brianna a text saying something like, "UPHILL!! F&&&&". However, by the time I got to the top I was pleasantly surprised that it didn't feel bad at all...and I let out a few thoughts of thanks to my dear Dixie for pushing us so hard on speedworkout nights!!!!! and for the brutal hill workout just the Wednesday before!!! I just loved how they had mile markers at every mile and each one had a great saying on it to motivate you!! They also had water stations at miles 3 and 5 which worked out perfect for me!! And the volunteers at each one were so supportive!! 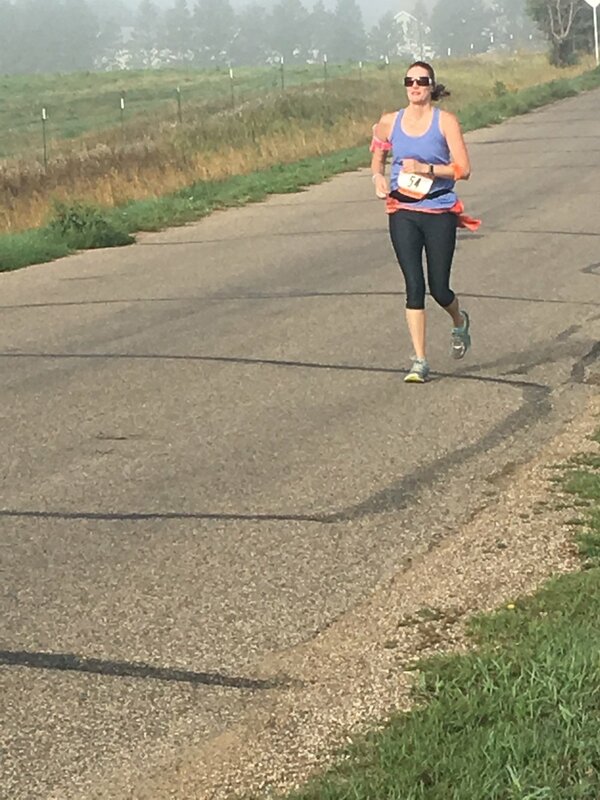 I was so excited at this point knowing I was running a better "race" than I was hoping for especially considering it was 90 percent trail and I had only run one 6 mile run the week before on the treadmill and it was a horrible run and that I only had a mile left. Little did I know that there were a few more smaller inclines and turns than I had realized and really had to work that last mile but it was truly so much fun. Due to the fog, even though I was watching my mileage on my TomTom, suddenly I saw the exchange not far in front of me!! And there was Amanda cheering me on as she had already sent our friend on her way and Brianna was cheering and ready to head out on her portion!!! This was our relay exchange. I took this photo the day before. Trust me, you could barely see the day of the race due to the fog. I was absolutely thrilled with my portion of the relay. My goal was to treat it as my long run for the week and it was such a great experience and so fun to be back racing and to do something so different. They had a driver ready to take us back to the finish line so we could meet up with our teammates once they crossed the finish line. The three of us decided to head out and find Brianna and cheer her on. I cannot tell you how super proud I am of Brianna for doing this race. She had hoped to run the full half marathon herself as her first big race but due to life she wasn't able to get the mileage in that she wanted so that's why she asked me to run the relay with her. SHE DID AWESOME!!! We were able to cheer her on at a couple different places and then went back to the finish line to meet her there. I highly recommend this race to everyone!!! They have a half marathon, the half marathon relay, a 5K and a kid's race!! The kids even get tshirts and medals. It is for a great cause to honor the memory of Crystal Jahner's dad and to raise money for a building in his honor. Please read more here. For a small race, this was so super organized from packet pickup, to the bus departure, the awesome mileage signs, aid stations, tshirts, medals, face painting for the kids, a few fun games, a running clothing booth, and a great buffet of bananas, rolls, water, chocolate milk and pickle ice!! I had never heard of these before and I was skeptical but dang they tasted good after the race!! We headed out for showers, let our shoes and socks dry out and headed for a fun meal together to celebrate. And of course, in normal after-race traditional fashion, Amanda and I went and got pedicures!!! And now, my "comeback" Crazy Horse Half Marathon is only 5 weeks away....EEKS! !